The Martin D-18 has been an iconic, workhorse guitar for decades, used by countless musicians of all skill levels. Its pairing of Spruce and Mahogany for the dreadnought body provide snap, sparkle and definition to a powerful tone. Introduced in 1931 with a 12 fret neck that was extended to 14 frets in 1934, the D-18 has been in constant production. 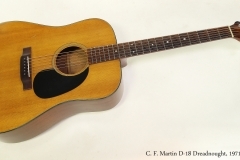 Here we have a 1971 vintage Martin D-18. It has definitely been used as intended and over the decades, it has experienced the usual wear and stresses. The finish is nicely checked and has the lovely patina that only comes from time and use. On the back, there is a wear area likely from a belt buckle, and there are a number of small dings, dents and scratches. For repairs, it appears that on the Martin D-18 there is no finish over-spray and no touch ups. 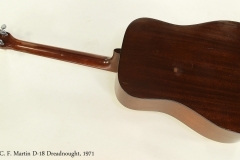 Almost all steel string guitars with dovetail joints will, over time, require a neck reset that corrects inevitable sag at the joint and rising action. Often, before this point is reached the bridge is shaved to lower the action. On this guitar, some chipping along the bass edge of the heel suggests that a reset may have been performed long ago. The Martin D-18 bridge has also been shaved, and while the guitar plays well now, in the future a new reset and bridge will be required. The frets have been dressed and polished. This Martin D-18 guitar is unusual and rare in its wood choices. In 1969, Martin officially ended the use of Brazilian Rosewood and switched to Indian Rosewood. However, some few guitars have been documented after that point with Brazilian for the fingerboard and bridge. Those components on this guitar have the definite appearance in colouring and grain pattern of Brazilian. As a 1971 model, this is the ‘newest’ Martin we’ve seen like this and must be one of the last, as Martin exhausted its wood stocks. A Martin case is included.